$$ Major Price Drop Again $$ Bring offers! !This is the popular 43 model that originated from the 38 ft. mold. They stretched her to include a five foot cockpit, great for fishing with a few friends, or launching the dinghy off the custom davits, and she boasts a nice size aft deck as well. Her profile has a distinctive trawler-type bow, but the 43 model is built on a modified v-hull with hard chines aft, and a long skeg below. The galley is down to port which opens up the salon considerably. There is a guest/day head just to starboard of the galley, aft of the quarter V- berth. She has a ton of storage lockers in the FULL Beam Master, with private head and separate stall shower.Bring offers!! United Yacht Sales New Jersey would love to guide you through a personal showing of this 43' Californian Cockpit Motoryacht 1984. 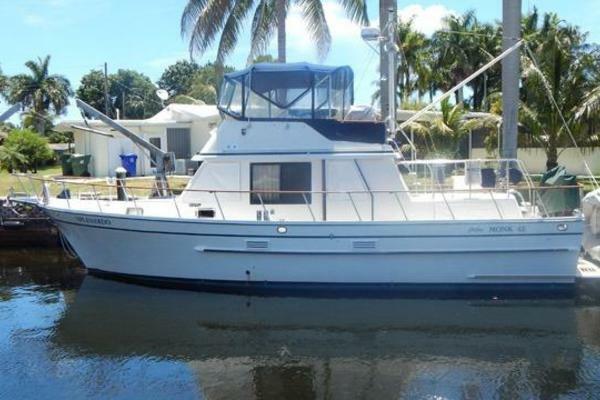 This yacht for sale is located in San Diego, California and priced at $39,900. For a showing please contact us by filling out the form on this page and we will get back to you shortly!